What a fascinating photo, Lisa. How did you do it? This was taken with our new Canon EOS Digital Rebel. 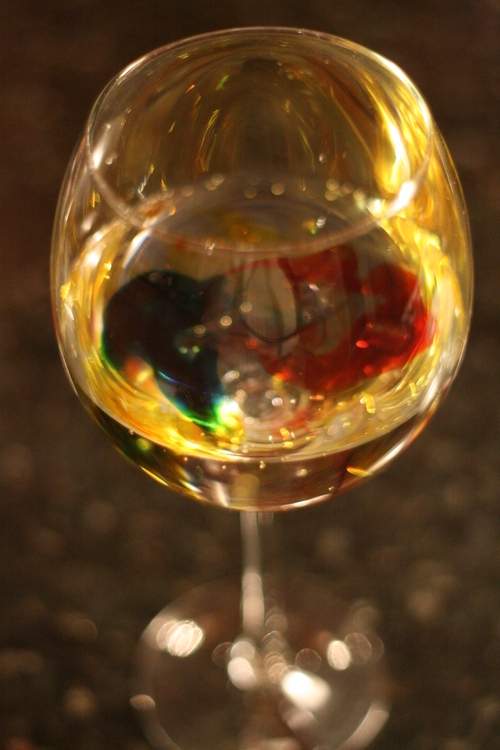 I put seltzer water in a glass, dropped in some food coloring, and put it on aperture priority. I set a really short depth of field (1.8, I think? ), to blur the background, and probably took 15 photos before I got one I liked! It was taken on our granite countertop, and the lighting was from the halogen lights above and the use of a fast lens. oooh! You have the camera we’re thinking of buying! I want to be able to use my old lenses from my Canon AE-1 and this is just the ticket. Right now we have a Fuji FinePix Digital that’s quite good, but doesn’t have the capability for SLR lenses from the AE-1. Lucky you!! Mary, when I was a teenager I was really into photography, so I’m refreshing it all now. Mr. BSR is uber-technical, which definitely helps. As he puts it, I have a better eye for finding things that would make good photos, but he’s better at actually taking them. I’m hoping to increase my technical ability so I’ll take better photos more consistently. Les, we also have the film version of the EOS Rebel. We replaced that with the Canon PowerShot, and now we’re stepping that up to the digital Rebel. So far so good, but it does tend to underexpose just a bit. Mr. BSR stops it up something like 2/3 of a stop, to compensate. We were also considering a Nikon, but that one overexposes and it costs about $ 300 more. Ouch!